Though certification isn’t even legal in Illinois, I proudly claim the title of “certified sushi aficionado” for myself. In fact, I even dream of opening an ecommerce store that sells sushi-making supplies to restaurateurs, called Sushi King. But more on that later. I think you will agree with me that Google Shopping (aka Product Listing Ads) is the go-to way of acquiring customers online. However, your bidding strategy will make or break your Google Shopping campaign. If you don’t set up a strong bidding strategy from the get-go, you will end up wasting money on Google Shopping ads. It’s a tricky balancing act; bid too high and you risk throwing money down the drain. If your bids are consistently low, on the other hand, you’re not going to receive high-quality traffic. Some products produce more value for your store. It makes no sense to have the same bid for a bestseller and a loss leader. Imagine sushi chef who throws away half of her rice supply before she even starts cooking. Don’t make the equivalent mistake! So, is there any way to solve the bidding problem? The answer is yes—but only if you clearly define your objectives, structure your campaign appropriately and set the right bidding strategy. In this article, I will show you how to set the right Google Shopping bidding strategy and optimize your bids for success. And I will use Sushi King as an example, so the information sinks in. You want to make more money for your ecommerce business. Clicks - Some ecommerce businesses simply want to maximize clicks. The idea behind this goal is that a high volume of clicks will expose your brand to a lot of people and start generating revenue in the long-term. If you’re at the stage where you’re focusing on building your brand, this can be an effective tactic. Conversions - Maybe your primary goal is to generate a high number of conversions. This goal helps your business build a base of paying customers right now, while hopefully also setting the basis for long-term success. This is also a good choice if you have high-demand products that produce large margins. 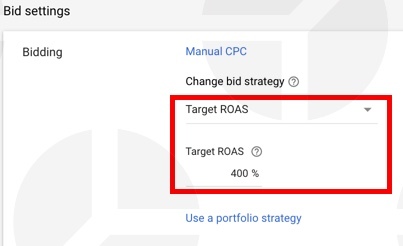 ROAS - You may care more about maximizing ROAS (Return on Advertising Spend). With this strategy, it’s not just about the number of conversions. Your goal is to get more conversions on products that provide a high return. If your ad budget is limited, this is a cost-effective way to make the most out of it. All of these strategies grow revenue. But the path to get there is different. Consider: is it more important for you to drive traffic? Are you focusing on getting more paying customers? Or is the primary goal to be efficient in your advertising spend? For Sushi King the goal is the same – increase in total profit. To achieve it, I would select a KPI to focus on for each Google Shopping campaign. Remember, each campaign is different and you need to select the right KPI to focus one as your objective. The bidding process is murky. Even many Product Listing Ads veterans are oftentimes uncertain about how to set maximum bids. However, you don’t have to rely on guesswork and gut feel. You are no longer in the Mad Men era. When bidding, you want to stay competitive within your target ROAS. However, you don't always know ROAS for your products. That's why you need to dig a little bit deeper. Conversion rate: Some products will convert better than others. Naturally, you should invest more resources into high-converting products. Figure out the average conversion rates for your products and bid accordingly. Product price: ROAS is largely determined by product price. Yet surprisingly, many ecommerce merchants don’t account for price. When I create a campaign for Sushi King, I want to bid more on the $100 knife set than $5 chopsticks. Gross margin: Price isn’t the only factor contributing to ad profitability. Bid higher for high-margin products as compared to low margin products. Calculate basic cost margins for every product and categorize them. Now, this is your starting point. Why? Because the formula tells you your breakeven point. Aside from the fundamental bidding equation, there’s something else you need to understand: the S-curve. Although the S-curve is a mathematical function, you don’t need a degree in calculus to understand its effect on bidding. Basically, there are two fundamental variables determining the success of a campaign: budget and revenue. Both variables mapped out on a graph with budget on the x-axis and revenue on the y-axis. The result - a shape that reminds a letter S: flat at the bottom, rapidly peaking upwards, and then flattening once more at the top. Underbidding. Lower bids tend to be ineffective in generating revenue. If you’re at the bottom of the bidding curve, you’re not getting traction. Bidding Bandwidth. The value of a bid starts to increase rapidly at this point. Overbidding. Now you start to see diminishing returns on bids. If you’re at the top curve, you’re paying too much for marginal returns. You want your bids to fall into the bidding bandwidth, the part of the S-curve that’s shooting upwards. The bottom line: hit the sweet spot on the S-curve. Exactly how do you get there? Well, that depends on your campaign structure. I’ve written about Google Shopping campaign structure in the past. Campaign structure segments your search traffic, giving you control over your bidding strategy. Remember: each campaign should have a unique bidding strategy matched to your goals. You probably have a group of top sellers or high-margin products. They’re consistently generating a large number of conversions or have better margins than other products. These products need special attention and better control of their bids. SKU (aka Product ID or Item ID) level bidding is the ultimate way to segment your bids. SKU level bidding gives you the power to drill down deep into your bidding strategy by placing bids on the product level vs. general product traits (such as category, brand, or custom labels). If you don't achieve true granularity then I can just about guarantee a game of 'see-sawing between overbidding and underbidding.' Thus, products that require lower bids could easily wind up wasting your budget, and products that could perform well but aren't bidding high enough wind up with a lack of impression share to generate conversions. But there’s a problem with SKU level campaign structure. It’s time-consuming to manage a large product inventory at the individual product level. It may sound like a great idea to segment out thousands of products and bid differently for every item in your warehouse. But if you're working alone on this campaign, or juggling multiple other demands of your job, you won't be able to touch every item's bid every week - and that has real costs. PRO TIP: perform an 80/20 analysis of your product inventory based on one or a combination of KPIs. (For example, revenue, conversions, or ROAS.) Then, create a focused and manageable campaign based on your target characteristic. Get this done by running a Shopping – Item ID report. Below is an example of a report with products sorted by revenue. You will see the top products make up a disproportional amount of revenue. Then, place a separate bid for each SKU in your campaign. Here is an example below. Use SKU level bidding on a select group of products to closely monitor your products which matter the most. If you have limited time, you can’t use SKU level bidding on all campaigns. Based on the experience stellar segmentation includes a combination of two product attribute segments. Kirk Williams from Zato Marketing shares his approach on how to make it work. Segment [products] out by type/color/size/brand... whatever works best for your industry, but pull the data out so you can begin to see what groups of products convert well so you can adjust bids accordingly! Sushi King, for example, will sell cutlery, flatware, and basic eating utensils, among other categories. In my ad campaign, I will place all of my product categories into each campaign and segment by brand or product type. With two-product attribute structure, I’m more specific in setting maximum bids for each respective category. Here is an example of how my cutlery campaign broken down by brand looks like. This structure allows me to lower bids on $40 Kai knives as compared to $300 high-grade Shun knife sets. In another example, I organize my sushi rolling mat inventory using the Product Type attribute and assign a category bid. If you are new to Product Type attribute, it’s a complimentary way for organizing your product inventory using your own criteria. Unlike the Google Product Category attribute, you choose which value to include. This helps me to create my own product categorization system in the product feed. Then, I use it for bidding in Google Shopping Campaigns. PRO TIP: use product type with multiple levels for deeper and more logical segmentation. Since Google doesn’t have standard categories for different rolling mats, I’ll create my own categories for the campaign. Then within each product group, I’ll set a bid for the respective category. In the example below, I am setting a bid for “Bamboo Rolling Mat Sets” product category. That’s how you handle category and product type bidding for your inventory. Now let’s get to even more flexible option – campaign structure with custom labels. Custom labels provide you with endless possibilities by enabling you to set your own values for five custom label value categories. You can (and should!) then mix and match them with other product attributes. Seasonal items. You have products in high demand during certain seasons. During these periods your competitors’ bids on these products will go up. Your goal is to be agile and react with bid changes when necessary. Promotional items. If you have ongoing promotions for certain products, your goal is to move the inventory ASAP. You should have a separate bidding strategy for items with promotions. Low margin items. You have products that don’t make any money for you. But these products drive awareness and help sell other products. You need a separate segment and separate bidding strategy for them. Most customers don’t buy the first time they click on your ad. They shop around. They compare your prices. They compare your value proposition. Your customers act in similar fashion. To find out your customer conversion path, run a Path Length report in AdWords. In the example below, you will notice that only about 46% of revenue was generated with one click. So 54% of revenue was generated from repeat visits. To generate repeat visits you need remarketing. You may be used to remarketing on display network. With this kind of ad, your banner ads follow people around on the web. This is different. You can remarket your repeat visitors on Google Shopping. This is where RLSA bidding—Remarketing Lists for Search Ads—comes in. Target your past website visitors or customers when they look for products again. All Visitors: Any visitor who has ever visited any part of your website. Product viewers: Visitors who have viewed a product page on your website. Cart Abandoners: Visitors who placed an item in their cart, but abandoned before purchase. Previous buyers: Customers who have purchased from you before. The keyword here is Audiences. I have created a framework for this called Retargeting Matrix. With RLSA campaigns, you place higher bids within your campaigns to different audiences. That way, you have a higher chance of getting traffic from likely buyers. For example, you may be willing to bid higher to attract people who abandoned your shopping cart vs. people who just browsed your website. The bidding for RLSA is done under Audiences tab, not Product Groups tab. See an example below. This structure will ensure that we are more competitive in bidding to attracting people from these audiences. Armed with knowledge of your campaign goals and structure, you’re almost ready to implement your campaign! But in order to execute, you first need to make a choice about your bidding strategy: are you going to use manual bidding or automatic bidding? Let’s take a closer look at each to help make that determination. The manual bidding method is where you set your own maximum CPC for your ads. Most of the examples I mentioned above used the manual bidding approach. You have full control on how much you are paying for each click. With more control, there’s a limitation – resources. The larger your Google Shopping campaign is, the more resources you will have to allocate to bid management. That’s why an efficient campaign structure will help you focus your efforts on priority items. These products give the biggest impact to your business. Products with wasted ad Spend: Products with no conversions will see decreased bids. One-off converters: Products with a low conversion volume but a decent conversion rate will be designated as one-off converters. Bids will be increased, but not very aggressively. Mid-range converters: Products in the mid-range of conversion volume and conversion rate will see an increase in bids. High-range converters: Products that are converting at a high volume and rate will have an aggressive increase in bids. Bids on cash bleeders: Products that require you to spend a lot on advertising just to see low returns are “cash bleeders.” Don’t expend high bids on them. Bids on products with high returns: Products that offer high ROAS should have higher bids because of the value these conversions provide. Bids on products with high impressions and no or low clicks: You can choose to increase bids on these products to generate more clicks from your impressions. Bids on products with no impressions: You can increase your bids on these products so you can start generating impressions. If you’re not getting any impressions, it’s likely your bids just aren’t high enough. Automated Bidding: Set It & Forget It. Or Is It? Manual requires a lot of attention to individual variables. Google now offers another option: Automated bidding. There are numerous automated bidding strategies available, each focused on a larger strategic goal. Examples: increasing conversions, getting more clicks, maximizing conversions within the ROAS limits. If you are using Google’s Automated bidding strategies, you will set these high-level goals. Then, let the algorithms and machine learning do the work. Alternatively to the KPI based bidding rules for manual bidding, Smart Bidding system uses multiple contextual signals to set bids. In the example below, the algorithm considers actual query, time of day and location data to set the bid. The algorithms rely on past data to optimize the bidding strategy. This means that automated bidding require a 90-day acclimation period to generate enough meaningful data for optimal results. The bidding strategy is optimized to get the maximum number of clicks. You set the max CPC bid limit and the system gets you the maximum number of clicks within your budget. Typically, this bidding strategy will generate lower average bids, increasing clicks. With this method, your bid changes depending on the likelihood of a conversion. To implement this strategy, you need historical data about which ads and searches perform best. Then, set up your campaign so that you’re bidding higher on the searches that are likely to result in a conversion. With this strategy, you’ll maximize conversion value and ROAS. You will set a target for average ROAS. The algorithm will then use past data to generate a bidding strategy. This basically means that you’ll bid higher for products that generate a high conversion value. Fundamentally, the three Smart Bidding strategies align with three different strategic goals: clicks, conversion rate, and ROAS. Each bidding strategy has advantages and disadvantages. To be successful with both options, you need to know the numbers for your business including KPIs, product margins and other metrics. they cannot account for product margins/cost of goods sold. You have to consider how each product stands on its own and whether a given product is actually improving the bottom line or if, even with conversions and revenue, it is merely leading to lost profits. There are more experts advising against automated bidding. For example Caleb Hutchings published his 5 reasons not to use automated bidding. Bids in Google Shopping campaigns are not final – they can be impacted by campaign priorities. When products overlap, priority settings (low, medium, high) control which campaign bid needs to be considered during the auction. You will find your priority settings in the example below. Pick the strategy that best fits the current needs of your business. When I’m starting out with Sushi King, my first option is manual bidding. With a proper campaign structure, bidding is handled in a structured way. Once I start scaling campaigns, adding more products and have more data, I would start testing automated bidding strategies. The keyword here is testing. Even though machines are capable of handling thousands of calculations in seconds, they lack context human brain has. Whatever Google shopping bidding strategy you select, you’ll need to exercise careful thought and planning during the implementation process. Google Shopping can drive traffic and revenue your way—but only if you are strategic. Succeeding with bidding requires a deep understanding of not only the Google Shopping system itself, but also your business and goals. Once you know where you want to go, you’re better-equipped to get there with optimal bidding.